Address: Mandore Road, Jodhpur, Rajasthan 342026 India. 36 guestrooms. Bal Samand Lake Palace feature ceiling fans and windows that open. Accommodations offer garden views. These individually decorated rooms include desks and ergonomic chairs. Toilet feature shower/tub combinations and complimentary toiletries. LCD televisions have cable channels. Guestrooms offer phones. A turndown service is available nightly; guests may request hair dryers and housekeeping is offered daily. 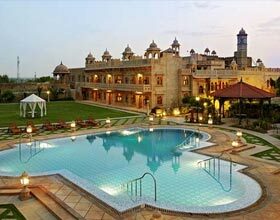 Bal Samand Lake Palace's restaurant serves breakfast, lunch, and dinner. A bar/lounge is open for drinks. Recreational amenities include an outdoor swimming pool. 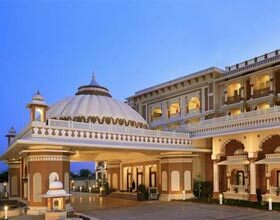 Bal Samand Lake Palace's 3.5-star property offers audiovisual equipment and business services. Wedding services and tour assistance are available. Complimentary guest parking is limited, first-served basis, and available on a first-come. Other property amenities at this Art Deco property include a coffee shop/caf�, a rooftop terrace, and laundry facilities. Room service is available 24 hours a day. 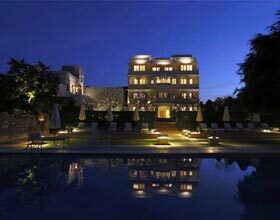 Bal Samand Lake Palace Jodhpur:- near to Jaswant Thada, Umaid Bhawan Palace, and Mehrangarh Fort.